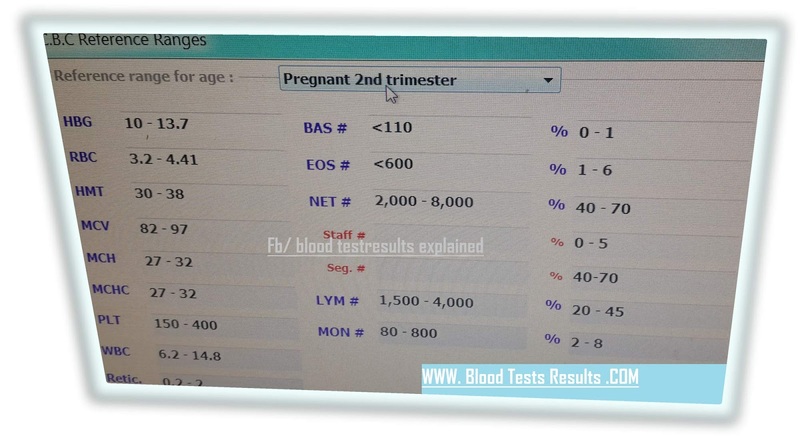 Normal allowed values in CBC test especially for pregnant female during the second trimester of gestation. Note that pregnancy course consists of three trimesters, each of which is 12 weeks which logically 3 months from the first day of LMP to the date of birth. Pregnant female has large physiological changes into her circulation especially in the middle of pregnancy, some changes are considered normal and standardized in all laboratories, while normal female show much wider allowed limits. What do my low CBC test results mean while I am in the middle of pregnancy? Pregnant body respond to physiological changes during pregnancy. Usually laboratory specialists see normal low values of hemoglobin for pregnant women, i.e 10.0 grams per deciliter, while such values considered moderate anemia for normal female. Consequently decreased RBCs and HCT value compared to normal female CBC values and 1st trimester pregnant CBC values too. Also, Total WBCs count limits increased than WBCS count in 1st trimester and reach 14,800 cells per microliter blood. Differential leukocytic count show push in limits due to emergency condition that the fetus make inside his mother’s circulation. For more explanation of your results pleases visit Fb page or send via email.